Compatible Canon Ink Cartridge, Gray, 3,500 page yield. Replaces Canon part number: PFI-106GY, 6630B001AA. Compatible Canon Ink Cartridge, Cyan, 3,500 page yield. Replaces Canon part number: PFI-106C, 6622B001AA. Compatible Canon Ink Cartridge, Magenta, 3,500 page yield. Replaces Canon part number: PFI-106M, 6623B001AA. Compatible Canon Ink Cartridge, Yellow, 3,500 page yield. Replaces Canon part number: PFI-106Y, 6624B001AA. Compatible Canon Ink Cartridge, Black, 3,500 page yield. Replaces Canon part number: PFI-106BK, 6621B001AA. Compatible Canon Ink Cartridge, Photo Cyan, 3,500 page yield. Replaces Canon part number: PFI-106PC, 6625B001AA. Compatible Canon Ink Cartridge, Photo Magenta, 3,500 page yield. Replaces Canon part number: PFI-106PM, 6626B001AA. Compatible Canon Ink Cartridge, Green, 3,500 page yield. Replaces Canon part number: PFI-106G, 6628B001AA. Compatible Canon Ink Cartridge, Red, 3,500 page yield. Replaces Canon part number: PFI-106R, 6627B001AA. Compatible Canon Ink Cartridge, Blue, 3,500 page yield. Replaces Canon part number: PFI-106B, 6629B001AA. Compatible Canon Ink Cartridge, Matte Black, 3,500 page yield. Replaces Canon part number: PFI-106MBK, 6620B001AA. Compatible Canon Ink Cartridge, Photo Gray, 3,500 page yield. 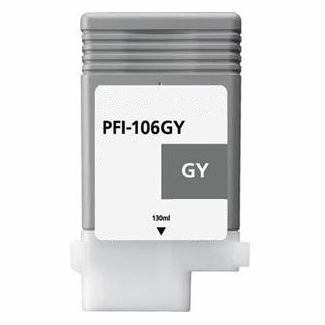 Replaces Canon part number: PFI-106PGY, 6631B001AA.